FED announcement regarding the rate hike will influence gold; besides, the US is publishing U.S. Consumer Inflation data, Retail Sales Data and Business Inventories which leads to Gold volatility. 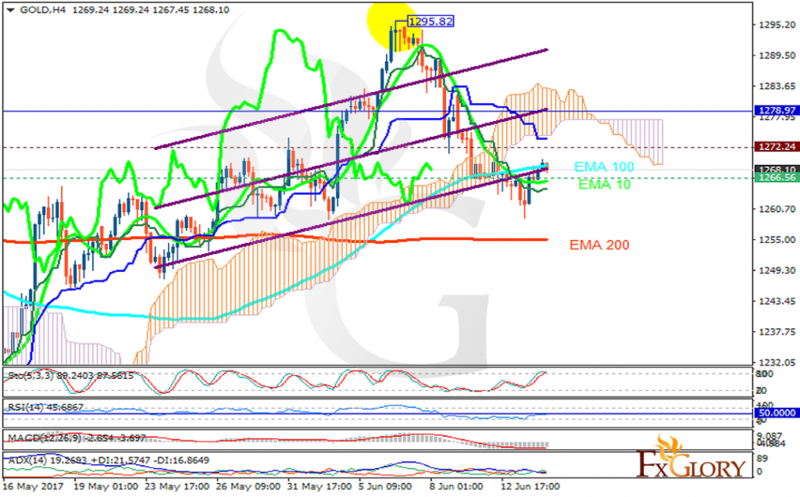 The support rests at 1266.56 with resistance at 1272.24 which both lines are below the weekly pivot point at 1278.97. The EMA of 10 is moving horizontally and it is above the EMA of 200 and below the EMA of 100. The RSI is moving horizontally on the 50 level, the Stochastic is showing upward momentum and the MACD indicator is in negative territory. The ADX is not showing any clear signals. The price is below the Ichimoku Cloud and the Chinkou Span. The Tenkan-sen and the Kijun-sen are both showing a horizontal trend. The chart seems bullish but it is not going beyond 1290 area.